Haven’t forgotten about ya’ll! So I don’t feel too much like a slacker, I’ve got a few options for the latest R3VOLT release to show off. The Aaron Jacket comes with a HUD, allowing for endless color combinations as well as various shirt patterns. Unorthodox has also released a line of beauty marks. Sure, Marilyn Monroe comes to mind when you see the words “beauty mark,” but this isn’t solely for the ladies. I’m sporting the Nas version and it looks pretty damn good. Facial Hair :: Unorthodox – Smoove NEW! Beauty Marks :: Unorthodox – Nas NEW! Jacket & Shirt :: [R3] – Aaron Jacket [V3] NEW! A chapter of my SecondLife/Real Life has come full circle. Relationships come and go, some out of your control and some because you know your efforts and feelings would be better invested elsewhere. Though rocky for the most part, my past placed me on a very specific path to where I am at this very moment. All things happen for a reason and therefore regrets quickly turn obsolete. You live and you learn as I have and I am thankful for the lessons that have been stuffed into my stubborn head. I would gladly repeat those tough times day in and day out if I knew that the ones I now hold dear would still be here, waiting for me once I stepped out of the storm. My life is nowhere near close to where I wish to be and that’s okay. I get closer and closer each and everyday with the love and support I have around me, lifting me up. It’s about time I begin to think about myself. I’ve washed my hands of what’s happened before. Time to live in the now and look forward to what lies ahead. Ok, serious rant over. Check out the swag below! 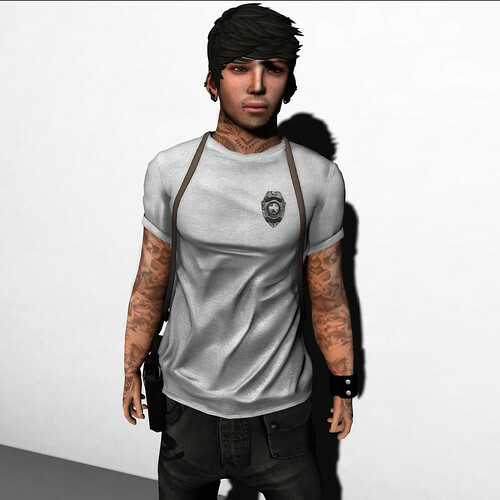 Hair :: Unorthodox – High Low Hightop Mesh NEW! Nose Ring :: AITUI – Septum Ring – Uneven NEW! Knuckle Tattoos :: Elska – Slink Hand appliers Press Play NEW! Boots :: Lucien.Marcelo // SUEDE ZIPPED MILITARY BOOTS NEW! @ The Mens Dept. So JamesEdwardQ of Speakeasy hit me up, asking if I wouldn’t mind posing for a new tattoo ad with hym. Jumped over to hys platform above the mainstore, dragged some friends along for the ride and for, most likely, close to an hour we all the best time goofing off. Somehow amidst all the chaos, Aubrianna Kingsley and James managed to capture some damn good shots. This Point of No Return tat comes in both color and black with fresh, medium, faded and really faded options for each. Tattoo :: Speakeasy – Point of No Return NEW! Tattoo ::Speakeasy – Point of No Return NEW!